Toast a happy couple and the unforgettable day they made it official with this personalized print. Raise a glass to a one-of-a-kind couple and the unforgettable day they made their bond official. Chicago-based artist Alexander Doll set scenes of wedded bliss in the context of a classic print announcement that is as stunningly unique as it is timeless. 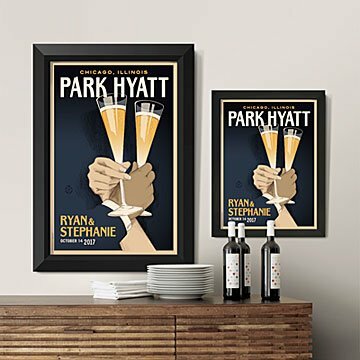 This nostalgic print hearkens back to the nuptial announcements of yesteryear with its sharp, sanserif typography, and hand-sketched illustrations featuring the bride and groom's hands suspended as they accept their best man or maid of honor's toast. Alexander incorporates personal details, such as the venue, city, date, and the couple's names to give each print a warm, personal touch. A sophisticated way to fete an unforgettable occasion, this inspired gift captures the couple's version of their fairytale while giving them a stylish and whimsical work of art to remember the thrill of the day with every passing glance. Printed on archival paper using archival pigment ink in Ohio. This is such a great wedding gift! The happy couple LOVED it ... perfect wedding gift! It is a unique gift that I wanted to give to my son and his fiancÃ©e as a wedding gift. It captures their style and personalities and I know they will love it! I am so happy with how this turned out! I ordered it as a surprise gift for my wife right after our wedding and she was totally blown away! One of a kind! I DARE YOU TO FIND ANYTHING MORE PERFECT! Flipping through your magazine, I was SO excited to see the selection of personalized gifts; I bought this custom piece as an anniversary gift to my husband. Our anniversary is December 31st and have booked a suite at the same hotel we were married. My plan is to deliver the framed piece to the hotel and ask that they hang it in the suite as part of the decor, then sit back and wait for my husband to notice and be blown away. Afterwards, I have the perfect place picked out to hang it in our home. There couldn't be a more personalized gift to remember an amazing day and I can't wait for the surprise! Purchased this as a wedding gift for my good friend and she loved it! Very nice quality. Special and personal gift. I've bought this twice now, and we will continue to give this as a wedding gift. The bride and groom have been so impressed by this personal and unique present. Love it! I can't wait to give the happy couple this gift next week. It turned out even better than I expected. It truly is a unique and keepsake gift! My daughter and her husband called right away when they received the gift. It was hung on the wall and has received many compliments. She said the quality is great too!! I gave as wedding gift and received as a wedding gift. Its a gift that always makes you smile when you see it.